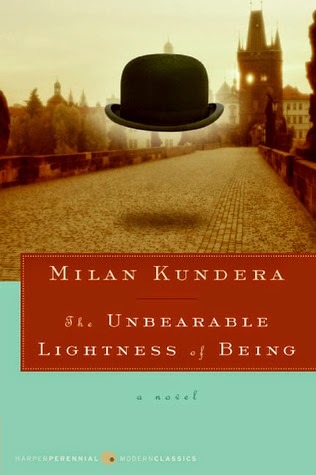 I was excited when my neighborhood book group chose the modern classic The Unbearable Lightness of Being by Milan Kundera because I vaguely remembered seeing the movie in the 80’s and had never read the famous novel. I am glad to have read it, but it turned out to be a somewhat difficult novel to read, a unique mixture of philosophy, politics, relationships, and love. Summarizing the plot succinctly is a challenge because it’s a bit convoluted. The story of several interrelated characters is set in Czechoslovakia in the 1960’s. Tomas is a divorced man and a serial womanizer who suddenly falls in love with Tereza, a woman who visits him in the Prague shortly after they meet for the first time. Tereza becomes ill, and Tomas nurses her back to health and develops the kind of connection with her that he normally avoids with his frequent female conquests. Their relationship is rocky, mainly due to Tomas’ continued casual dalliances with a lot of other women. One of those women is Sabina, who serves as the sole connection between one set of characters and the other. Sabina is an artist who, in addition to her trysts with Tomas, is also having an affair with Franz, a married man living in Geneva, where Sabina moves when Russia takes over Czechoslovakia in order to preserve her artistic freedom. Franz is in love with Sabina and is even willing to leave his wife for her, but Sabina prefers to remain a free spirit. Confused yet? This story of interconnected relationships takes place against a fascinating historical backdrop as Russia invades Czechoslovakia, and its residents try to find a way to live their lives amidst drastic changes in politics, work, and culture. The action moves from Czechoslovakia to Switzerland to France and back again. And against all of those political and personal goings-on, the author muses on deep philosophical issues, like the meaning of life, the effects of choices and fortuitous events, and what love really means. I read that passage aloud to my husband, as I was starting the book on the first day of a family vacation and said, “uh-oh.” It’s not exactly beach reading. That passage really made me think about all the expectations and demands I place on those I care for most deeply. I wasn’t thrilled with all of the cheating male characters in the novel and struggled a bit to wade through some of the complicated prose (sometimes you just read a sentence and think, “huh?”), but ultimately, I am glad I stuck with it and read it. We certainly had a lot to talk about (for those who had finished the book anyway!) Now, I am curious to watch the movie again because I don’t remember it very well. I am interested to hear what others thought about this highly regarded modern classic. I've seen this one around and I wasn't sure if I should pick it up or not. It seems to be something that you should read slowly. Maybe one day I will read it. Thanks for the nicely written review. Confusing and complex books often make for good book club discussions. Glad you stuck with it, and it sounds like an interesting culture/time period. Thanks for sharing with #smallvictoriessundaylinky last week. Sorry I’m late commenting/pinning but do hope you've linked up again this week !